Fifth avenue BID: 1,2 km of central street. The red outline is that of the BID. The fifth avenue is very, very long; avenues in Manhattan go from north to south in the island, and this is longer than 10 km. Along this distance there are many neighborhoods and diverse settings, and here I’m interested in the Fifth Avenue Bussiness Improvement District, one among a series of such public- private partnerships for the maintenance and retail promotion. Other parts of the avenue are included in BIDs, but this one is the most iconic for the image this street conveys to the world. 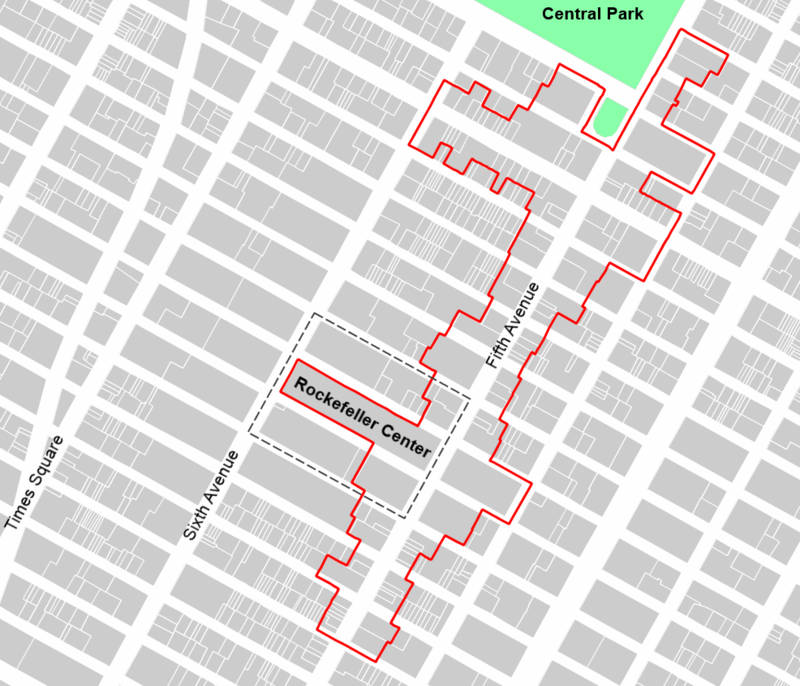 The BID encompasses a section of 1,2 km of the fifth avenue and a variable depth on lateral streets; for instance, the Rockefeller Center, drawn on the upper map with a hatched black rectangle, is not completely into the BID, while the 57th st section goes from Madison Avenue to the Sixth. This shows that the perception of space and its influence areas by retailers is adapted to specific factors, not related to geometric regularity. 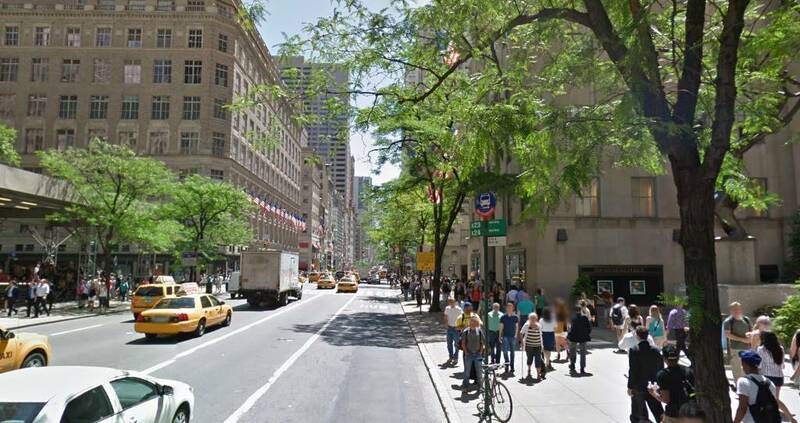 Fifth avenue is slightly more that 28 m wide. There are three lanes in a single direction (towards downtown) and a bus lane. This leaves 6 m sidewalks. No doubt, this street is associated usually to luxury, but sidewalks are of concrete, without great detailing, but for some tree grids (there are few trees) as those of the Rockefeller Center. 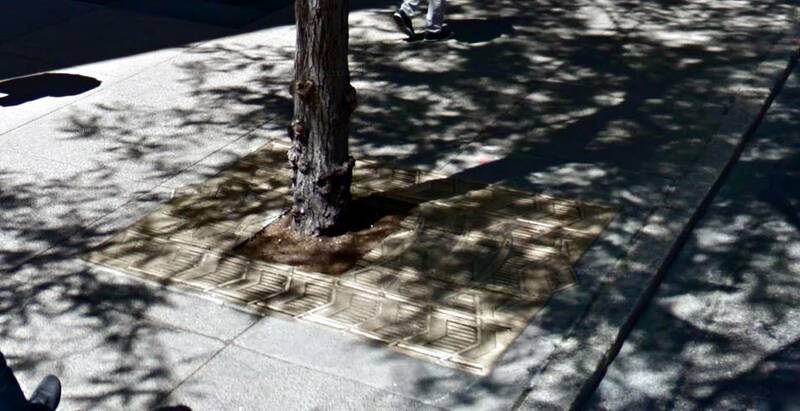 There are also remarkably few underground infrastructure access plates.